“Knowledge workers spend about 20 hours a week doing e-mail, and one-third of that e-mail is useless,” explains Zeldes. Worse, 70 percent of e-mail gets handled within six minutes of arrival and the average worker is interrupted every three minutes, according to research. “When you switch between tasks, you incur a cognitive reorientation cost,” says David Sward, a senior human factors engineer at Intel and one of Zeldes’s partners on the infomania project. The bottom line was that Intel’s workers were wasting about six hours a week. The article mentions some of the “technology-assisted behavior change” they are putting in place to minimize this wasted time, including delivering email less frequently and programmatically suggesting good e-mail etiquette as messages are sent. Good stuff. Posted by brad at 5:26 pm on June 29th, 2007. 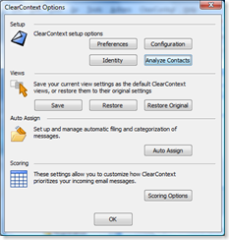 Have you been using ClearContext for a few months? Would you like to improve ClearContext’s prioritization accuracy? On setup, ClearContext analyzes your email history to rank contacts by priority. Over time, this information can become dated as new contacts become more important to you. 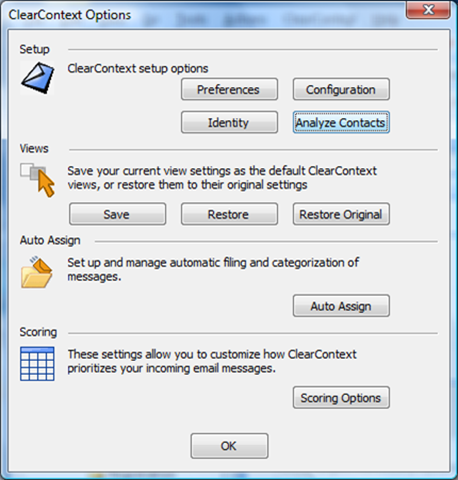 You can re-run this process at any time by going to ClearContext > Options and pressing the Analyze Contacts button. This will re-prioritize most of your contacts while leaving your manually set contact priorities in tact. Take a few minutes and give it a run. For more information on prioritization and contact analysis – including a video tutorial – see our User Guide. Posted by brad at 5:27 pm on June 27th, 2007. I like this article from Entrepreneur.com on better email management. It’s a little different than most of the “Top-X” email lists, focusing on block and tackle suggestions such as learning the in’s and out’s of your email client and maximizing use of folders. Check it out. Posted by brad at 3:29 pm on June 20th, 2007. Since our last product plan update during v3 development, we’ve had the chance to take a step back and evaluate both upcoming IMS enhancements and our longer term product suite strategy. We’re excited to tell you about what we’re working on now. Following a near term incremental release, in our next major development cycle we’re extending the ClearContext Product Suite with smarter email management; personal project management; and analytics, reporting, and alerting capabilities as outlined below. Project view for maintenance of project related items including Tasks, Appointments, Emails, etc..
v3.2 will be released this summer. Watch this weblog for additional information on release of the ClearContext Product Suite and beta test program. A new version of IMS Pro is available for download here. v3.1.1 is a maintenance release that addresses a few minor issues, including a stability problem with the Email Support function, the ability to add Exchange addresses to the Detected Email Alias field in Identity and a change in the way IMS handles offline contacts in cached exchange mode. Unless you have experienced an issue in one of these areas, it’s not necessary to upgrade from v3.1.0. Posted by brad at 3:23 pm on June 1st, 2007.